For the next week or so I’m driving around the Midwest with my friends in the Backyard Committee. It’s a great lineup of musicians and our first night was a blast — the music is a bit on the rootsy, Americana side with a lot of room for improvisation and trying out new ideas. Lately the shows I’ve been playing have been a little more strict, at least in the sense of learning very specific parts and arrangements, so having some room to stretch out makes for fun nights. Along with the drumming duties I’ve been assigned the role of recording engineer — the plan is to record every show and release a live album of the best material. It makes the shows, for us at least, engaging on another level as every night is essentially a recording session, albeit one in front of people. For the recording geeks out there, we’re double-micing every source, with one line going to the front of house and the other line sent to my mobile recording rig, a Universal Audio Apollo with eight additional preamps supplied by a Audient ASP880 feeding into Pro Tools. It’s a quick setup and on these smaller stages avoids any issues with splitters or negotiating with house engineers. Knocking on wood here, but so far things are sounding great with no hiccups. 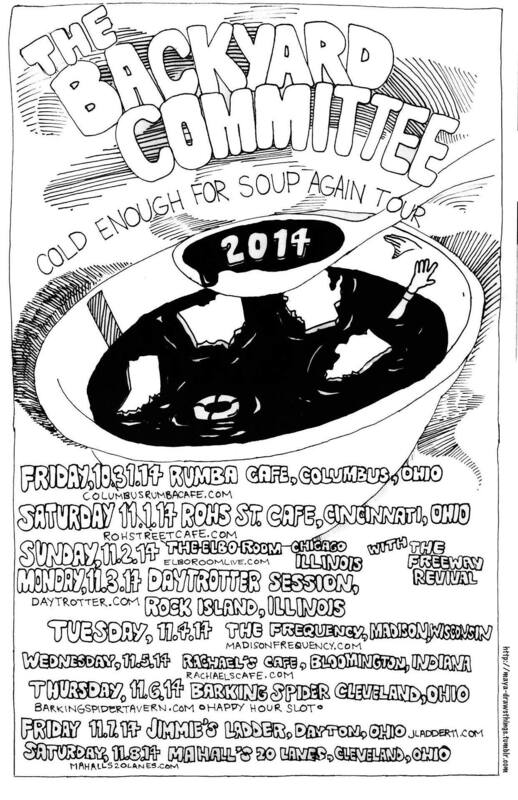 Check out the dates on the fabulous old-school poster below, and hope to see you if we’re coming to your town!